Home | Newsletter 165: Time for Jobs with Dignity for All! Newsletter 165: Time for Jobs with Dignity for All! 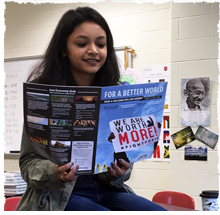 Issue 13 of For A Better World is here! This issue looks at the role of dignified work in a just economy. Here in the U.S. the movement to Raise the Wage & guarantee fair pay for all is gaining momentum. We get perspectives from both the policy side and from businesses like Dr. Bronner’s, who are already paying a fair wage. We also tell stories from those struggling to make ends meet under challenging policies and those who are fighting for justice in their communities. Read more online, or pick up a copy in one of 1400 natural food stores, fair trade shops, cafes, & more around the country. We want to be a resource for you & your cause! Snap a picture of this issue with you in your community, whether you’re organizing for a fair wage, climate justice, or just enjoying a cup of fair trade coffee with friends. Tag us on Twitter or Instagram with the hashtag #FightForFair so we can see how our work supports yours! 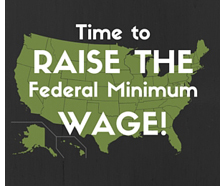 Take Action: Time to Raise the Wage! Workers around the U.S. are coming together calling for an increase to the minimum wage in their communities. Costs continue to rise for everything from food to housing to health care, but the federal minimum wage remains stagnate. While a few communities have taken action to support workers, others have gone in the opposite direction, banning higher wages. That’s why action is needed at the federal level to ensure no workers are left behind. Tell Congress you support raising the federal minimum wage for all workers, in all states, including wages for workers like farmworkers and tipped workers who are sometimes left out of minimum wage laws. We’re thrilled to report on the success of our campaign to support farmworkers on the Sakuma Brothers farm in Washington state. Nearly 10,000 of you signed letters supporting their right to organize, letting Sakuma Brothers and one of their biggest customers, Driscoll’s Berries know just how important a fair food system is to us all. On September 12th, workers voted to be represented in further negotiations by Familias Unidas por la Justicia, concluding a four year long labor dispute and boycott. We hope that this process provides a model for farms and workers everywhere for a food system that’s fair and financially viable for all.